Caffeine might be the only drug that users actually boast about being addicted to: how many times have you heard someone proudly declare themselves a “junkie” while they’re waiting for their third coffee of the day to finish brewing? It’s a socially acceptable addiction, and it’s extremely common: approximately 80 percent of US adults report regular caffeine intake, and that number goes up to 90 percent around the world. In today’s frantic lifestyles, caffeine dependence is more the rule than the exception. The widespread use of caffeine has also generated an intense interest in its potential health effects, and an endless flow of research attempting to quantify what, exactly, our caffeine habit is doing to us. But unfortunately, all these studies have so far failed to conclusively answer the question of whether or not caffeine is actually healthy. The results seem to change every week, and many of the trials are based on massive one-time doses of caffeine, which has almost no relevance to the regular caffeine users who like a cup of coffee in the morning. This makes it very hard to sift through the research and find studies that are actually useful. Coffee lovers latch on to studies that find benefits from drinking it, while skeptics cite an equal number of other studies showing its dangers. In part, this might be because all the studies are simply asking the wrong question. From an ancestral health perspective, we know that “is it healthy?” is often uselessly broad – the real question is “is it healthy for this person, in this context?” By asking that question, it’s possible to get a much better idea of how you personally can decide to use, or not to use, caffeine in a way that optimizes your health. It’s easy to think of caffeine addiction as a modern invention, driven by our ever-lengthening work days, hectic commutes, and 24/7 flow of entertainment, information, and social commitments. Did anyone even want Red Bull before the modern lifestyle? Evidence on this from the actual Paleolithic is obviously nonexistent, but plenty of documented hunter-gatherer groups do use stimulant drugs of various kinds – there’s nothing inherently “unnatural” about them. Native American hunter-gatherers enjoyed tobacco (like caffeine, a stimulant and appetite suppressant drug) long before the arrival of Europeans to the continent. Kanna, another botanical stimulant derived from a wild-growing plant named sceletium tortuosum, was popular among pastoralists and hunter-gatherers in South Africa. Then there’s kratom, a leaf still commonly chewed in Thailand as a stimulant in low doses and an opioid if you get too much of it. And don’t forget Weston A. Price’s admiring description of the Inca in South America, who chewed coca leaves (the same leaves used to make cocaine) for energy during long days of physical labor at high altitudes. Again, none of these are examples from the actual Paleolithic, but they do make it very clear that stimulant-type drugs are not just an invention of the Starbucks generation. They’ve been used, and used widely, among healthy cultures as far back as we have records to look at. The question isn’t whether stimulants themselves are all bad; it’s about the appropriate time, place, and amount of those stimulants, and about how they fit into the context of your entire lifestyle. That’s where modern coffee addicts really differ from their predecessors. It’s one thing for a robust and well-nourished person to use mild stimulant drugs in the context of an otherwise healthy diet and lifestyle. It’s quite another for an overweight but malnourished person to abuse extreme doses of refined stimulants for an artificial “energy” that covers up the effects of their nutrient-poor diet and sedentary lifestyle full of chronic stress and sleep deprivation. So the relevant question isn’t really whether or not caffeine is healthy in the abstract; that’s too broad to be useful. It’s about how much caffeine can fit healthfully into a given person’s lifestyle, taking into account the many other factors that can have an effect. To make that decision for yourself, it’s worth knowing a little about the health effects of caffeine, both the upsides and the downsides. A deep medical discussion of the stimulant response isn’t really the focus of this article, but here’s a brief overview: if any of these effects look like they might be of special interest to you, they’re worth investigating further. 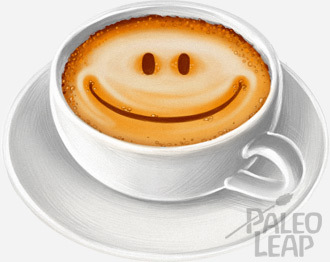 The most obvious benefit of caffeine is its stimulant effects. It wakes you up in the morning. It pulls you through the 3pm slump. Habitual caffeine users start to develop a tolerance to it, of course, but complete tolerance (the point where no amount of caffeine does anything for you any longer) is very rare. Even in people who have a coffee every morning, that coffee is still doing something for them. On the down side, though, it’s important to note that the beloved “pick-me-up” effect is not a magical gift of sunshine energy from the coffee gods. It has a cost. Caffeine works by blocking the reception of adenosine, a chemical that tells your brain it’s time for a nap. The caffeine binds to adenosine receptors, so it stops the “I’m tired” signal from ever reaching your brain. In other words, caffeine does not make you any less tired. It just lets you lie to yourself about how tired you are. To achieve its energy-boosting effect, caffeine also stimulates the sympathetic nervous system, the “fight-or-flight” response that prioritizes survival and gives you instant energy to save your own life. That’s why it’s such an effective concentration aid: your brain thinks your term paper is a life-or-death emergency, so naturally it puts in 110%. Regular use of caffeine is telling your body there’s an emergency all the time: it’s a Grade-A example of a chronic stressor, with all the attendant dangers. Scientists can, and have, measured this. Caffeine consumption raises levels of the stress hormone cortisol. The caffeine does this on its own, and it also triggers your body to produce more cortisol than usual in response to other stressors, especially mental stressors. Chronically high cortisol is bad news: it can throw your circadian rhythms out of whack, depress your immune system, change the composition of your gut flora, and even make it harder to lose weight. That all sounds pretty dire, but it’s important to take everything in context. Caffeine is one stressor, and the human body is designed to handle a certain amount of stress without a problem. As far as we can tell, many people in traditional societies handled the stress of stimulant drugs just fine within the context of their lifestyle. If you’re eating well, exercising well, and getting enough sleep, your body might be able to handle the small additional stress from caffeine with no problems. But most people use caffeine to pull them through times when they’re already stressed from something else: in this case, it’s just adding more fuel to the stress-overload fire. Only you can tell which situation best describes you. As many ex-coffee drinkers know, caffeine’s stimulant effects also mean it can prevent you from sleeping when you do want to. In some people, just one cup of coffee in the morning can make for a restless night. Even people who fall asleep easily and stay asleep through the whole night might still be suffering the side effects: caffeine can reduce the time you spend in deep sleep (the most restorative phase), so even though you spent 8 hours unconscious, you still aren’t really rested. This effect is very individual, and depends mostly on the person. Almost everyone will have trouble if they overdose on caffeine pills right before bedtime, but very few people are still wired from their morning latte by the time they fall into bed. Most regular caffeine consumers have already figured this out for themselves, and only consume caffeine too early in the day to affect their sleep. Again, the question isn’t whether caffeine affects sleep, but whether caffeine affects your sleep. Coffee, most people’s caffeine hit of choice, helps speed up digestion, and acts as a mild laxative (as some novice coffee drinkers find out the uncomfortable way after drinking too much at once). Interestingly, this is also true of decaf, suggesting that it’s something else in the coffee, rather than the caffeine, that does the trick. But since coffee is most people’s caffeine vehicle of choice, it’s worth a mention as a potential side effect, for better or for worse. This laxative effect can help relieve constipation, although if you find yourself reaching for it again and again, it’s more useful to figure out what’s causing the constipation in the first place instead of simply treating the symptoms with another espresso. But as an occasional tool, it’s one of the safer and more widely available laxatives around. On the other hand, caffeine’s stimulant effects on the digestive system can also have a downside. Coffee is one of the most frequently reported heartburn triggers, and many people suffering from GERD or acid reflux find that eliminating caffeine noticeably improves their symptoms. Fitness fanatics know that caffeine is a powerful ergogenic, a substance that increases your capacity for intense exercise. When you’re caffeinated, you can go harder, faster, and stronger than you could otherwise. Ephedrine and other more powerful ergogenics are illegal; caffeine is one of the few that anyone can buy, use, or add to a workout supplement mix. This sounds great – who wouldn’t want a quick and easy way to get some extra energy in the gym? But on the down side, many pre-packaged workout supplements contain so much caffeine that it’s easy to overdose. And relying on caffeine to kick-start your workouts can easily lead down a path of overtraining, where your body desperately needs a rest, but you don’t realize how exhausted you truly are because you’re masking it with a stimulant. So caffeinated workout supplements are tools to use very cautiously, and not a replacement for regularly scheduled rest days and recovery work. 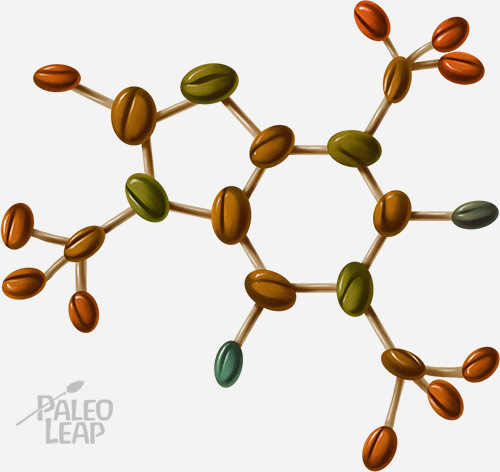 Some research has indicated that caffeine may interfere with nutrient absorption. One common argument is that caffeine reduces bone density. One study found that caffeine had only a very tiny effect on bone density and calcium absorption, nothing to worry about if you get anywhere near enough calcium in your diet. On the other hand, another study found that elderly women who consumed more than about 3 cups of coffee per day had higher bone loss at the spine, possibly because the caffeine interfered with the metabolism of Vitamin D.
Iron is another nutrient of concern. Caffeine itself has no effect on iron absorption, but certain other compounds in coffee and tea can inhibit it. This is only a concern if you’re drinking coffee alongside the iron-containing food, though, so just keep it away from your steak and you should be fine. Overall, the effects of caffeine on micronutrient status are quite small. If your diet is deficient in iron or calcium already, caffeine could be the last straw, but if you’re regularly putting back plenty of meat and vegetables, there’s very little to worry about. Another common worry is that caffeine can actually throw off your heart rhythm or somehow damage the cardiovascular system – an understandable concern to anyone who’s ever overdosed and felt their heart thundering away like it’s about to explode right out of their chest. Caffeine does increase heart rate, but there’s no documented danger to healthy people below 300 milligrams a day (approximately 3 cups of coffee). If you overdose, you might have problems, but an overdose of anything is dangerous, so this doesn’t prove anything about a reasonable and moderate consumption. The reports that coffee increases blood pressure are greatly exaggerated: in non-habitual drinkers, a huge dose of espresso does indeed raise blood pressure, but in habitual drinkers, there’s no effect. So once you’re accustomed to consuming a certain amount of caffeine, there’s really nothing to worry about. Even in subjects who were already hypertensive, researchers found no long-term change in blood pressure from caffeine intake. There’s some evidence that caffeine can impair glucose tolerance, making it more difficult to digest and metabolize carbohydrates correctly. This is especially relevant for diabetics, but the effect holds true even in healthy adults who regularly drink caffeine (meaning that they’re used to it; it’s not just the sudden shock of a caffeine rush they don’t normally get). On the other hand, though, several different studies have also shown no effect of caffeine on glucose metabolism. One study even found that, in overweight men with slightly impaired glucose tolerance, caffeine actually improved glucose metabolism. This tells us that it’s clearly not as simple as “caffeine makes you insulin resistant;” again, it all comes down to the individual. Often cited as evidence that the potential dangers of caffeine are negligible or nonexistent, various studies have shown that a moderate intake of coffee and/or caffeine is correlated with a lower risk of neurological diseases (Alzheimer’s, Parkinson’s, etc. ), certain cancers, Type 2 Diabetes, and cardiovascular diseases. Coffee-lovers argue that if 4 or more cups per day is correlated with a reduced risk of stroke, there’s clearly no long-term risk from any of the supposed increases in blood pressure or changes in heart rhythm. By the same token, if caffeine helps prevent neurological diseases in the long term, how could it possibly be damaging to your central nervous system? And if it’s associated with a reduced risk of diabetes, it clearly doesn’t make you insulin resistant. The problem with all of these arguments is that surveys only show correlation, not causation. Possibly there’s some completely different factor associated with caffeine intake that causes these benefits. It’s also not always clear whether the protective effect is due to the caffeine or to other compounds in the coffee (for example, it’s also high in antioxidants). Some doctors even claim that if you’re drinking coffee, you’re not drinking sugary soda, so the “benefit” is only from the exclusion of something even less healthy. But on the other hand there’s substantial evidence that at least some of the effect is the caffeine: for example, this study in older adults found that caffeinated but not decaf coffee was associated with higher performance on tests of mental function. Another study specifically in Parkinson’s drew the same conclusions. The upshot is that coffee and/or caffeine consumption may have significant long-term benefits, but before you take it up as an anti-aging supplement, bear in mind that the research is fairly preliminary and inconclusive. These studies really fall more into the category of “nice potential side benefits if they actually pan out” than arguments for immediately taking up a coffee habit. Clearly, caffeine isn’t good or bad in the abstract; it’s good or bad in context, depending on who you are and how you use it. So how can you tell if your caffeine consumption has crossed the line from reasonable to dangerous? If any of the red flags below look a little too familiar, it might be time to sit down for a heart-to-heart with yourself about why you’re actually reaching for that extra cup of coffee. Caffeine is beloved by crash dieters because it’s a very effective appetite suppressant. The constant gnawing hunger of a 1,200 calorie starvation diet is exhausting and puts you in a bad mood all the time; a cup of coffee can make your stomach stop growling and perk you up a bit, temporarily giving you the mood and energy benefits of a meal, without the calories. But Paleo is not a crash diet, and if you’re hungry, you should eat. Hunger is a healthy and normal sign that your body needs food for energy; hiding your appetite with a stimulant drug is not the solution. Remember that caffeine doesn’t just impair your sleep by keeping you up at night – you can fall asleep right away but still be suffering the consequences. If you wake up in the morning feeling unrefreshed or still tired, it might be a clue that you’re not getting as much deep, restorative sleep as you need, and caffeine is a prime suspect. Are you only pleasant to be around when you’re fully caffeinated? Are you stuck in a vicious cycle where every can of Red Bull gives you a mood boost that slowly fades into intense depression, irritability, or exhaustion, which you then have to fix with more caffeine? These are all signs that you’ve become too dependent on your caffeine fix just to get through the day – and probably also that you’re using at as long-term replacement for sleep (see below). Fatigue is not a caffeine deficiency problem. Realistically, there are occasional times when you need to use caffeine to stay awake, and times when that might even be your best option. Sometimes, you have to drive at night, and a cup of coffee is a lot less bad for you than a head-on collision with a semi truck. But if you’re relying on caffeine to cover up a regular, chronic sleep deficit, you’re abusing it. At this point, it’s time to take a hard look at your priorities and re-evaluate whether you’re going to accept being sleep-deprived (and thus less healthy) in exchange for doing something that you value more, or whether those all-night Game of Thrones marathons aren’t actually that important after all. Many people find their way to Paleo through trying elimination diets to see what specific foods are aggravating their health complaints. Caffeine isn’t a food, but it’s worth your while to treat it the same way in this case – the best way to get an honest idea of how you react to it is to detox, then reintroduce. A 30-day “caffeine fast” should be plenty of time to get over the withdrawal symptoms (headaches, exhaustion, irritability, crazy sleeping patterns…) and figure out how you really feel without any psychoactive drugs changing your brain chemicals around. You might find that without the crazy sugar highs and lows of a carb-based diet, you don’t even need your coffee to stay awake. Or you’re suddenly feeling just as good with a lot less of it. Even if you thought you slept fine before, you might start noticing that you feel more rested and calmer, less prone to emotional highs and lows. On the other hand, you might also find that your digestion slows down, and your workouts take a hit, at least until your body gets used to functioning without the drug. You might not see any particular benefit from giving it up – that’s fine, too. The point is to get a clear and accurate picture, whatever that picture might be. Post-detox, if you do decide that caffeine can be a healthy part of your lifestyle, the next step is to watch where you’re getting it. A cup of green tea is one thing; an Orange Creamsicle Frappuccino topped with whipped cream and candy sprinkles is quite another. Don’t fall into the trap of drinking “coffee” or “tea” that’s more sugar than anything else. In general, plain tea and coffee are least likely to do you any damage, and they also contain several other antioxidants in addition to the caffeine. There’s nothing in them that you can’t also get by eating your vegetables, but it’s a nice bonus. Add some coconut milk if you like your drink a bit lighter (you can also use heavy cream, if you tolerate dairy well). Another Paleo classic is Bulletproof Coffee (with several tablespoons of butter, coconut oil, or both blended in). Definitely steer clear of Red Bull, 5-Hour Energy, Monster drinks, and anything else that comes in a can plastered with neon labels. On the other hand, if you don’t want to take up caffeine again after your detox, but miss the taste of your coffee in the morning, you have options. Decaf coffee and tea does still contain a little caffeine, but it’s barely noticeable unless you’re extremely sensitive. Herbal tea has none at all (watch out, though: many herbal tea bags contain artificial sweeteners). Another alternative is Teeccino, an “herbal coffee” that has no caffeine of any kind but provides the same warm cup to nurse over the Saturday morning paper (most flavors are made with barley; these are not). Caffeine definitely falls into the “your mileage may vary” category. Some people feel just as good with coffee as without. Others don’t even realize how lousy their sleep was until they try a caffeine detox and give up the Mountain Dew that was wreaking havoc in their system. A good starting point is to look at how healthy stimulant-consuming cultures do it. Judging from their example, moderate caffeine intake is likely to be fine for a person eating a healthy, whole-foods diet and getting enough sleep. Is that the way you’re really using caffeine? Or are you relying on it as a crutch to power you through constant late nights, early mornings, and inadequate nutrition? Answer that question honestly, and you’ll be well on your way to discovering how much, if any, caffeine is appropriate for you personally to consume.